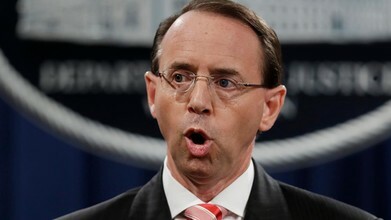 Deputy Attorney General Rod Rosenstein has reached an agreement with Attorney General William Barr to stay on at the Justice Department "a little while longer," a source familiar with their conversation told Fox News — despite initial plans to step down by now. Fox News and other outlets previously reported that Rosenstein had planned to step down in mid-March. However, sources close to the deputy attorney general say Rosenstein has not yet given his two weeks notice. He remains at the DOJ as Special Counsel Robert Mueller's Russia probe enters what is widely believed to be its final phases. There has been much speculation that Rosenstein would like to stay in his post until the investigation concludes.